The Basic Science Exam Past Questions is designed for student in the Junior Secondary School JSS level in Nigeria, It follows the National Education Research and Development Council (NERDC) approved Curriculum. To help reduce the workload We have compiled all JSS Past Exam questions and answer from First Term – Third term, to serve as a reference material to help teachers set tests and examination questions. School pupils and tutor will find it useful for revision and exam preparation. 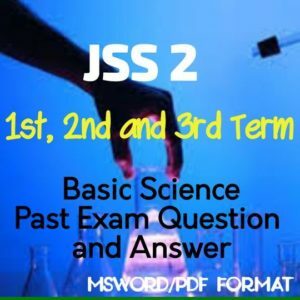 How to Download Basic Science JSS 1, 2 or 3 Past Exam Questions Paper. Is based on the Nerdc Curriculum. Can be Printed out into hard copy. Call or whatsapp me on 08051311885 for the simple step on how to get your soft copy. – The brain and the spinal cord. – Simple reflex action and examples. – The sense organs eye, ear, nose, tongue and skin and their functions. 4. Sense organs (II): Nose, Tongue and Skin. – Transfer of information through information technology e.g. Television, radio, etc. – The internet – meaning and definition. – Relevance of communication to human development and family life education. – Portrayals of body image by the media. – Process, transfer of information through information technology. – Qualities of good media programmes. – How and where information technology is used e.g. radio, telephone and microphone. support, transmission, feeder pillar, etc.